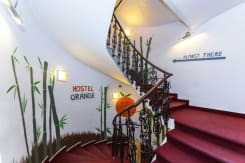 If youre looking for a quiet, comfortable, cheap and just cool hostel right in the centre of Prague, Hostel Orange is the right place! 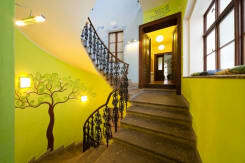 It's the only hostel located right on Wenceslas Square in a beautiful historical house, so you won't need to use any public transportation or spend your money on it. 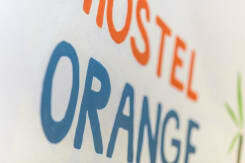 Staying in Hostel Orange, youll be in the centre of the commercial, cultural and historical area. 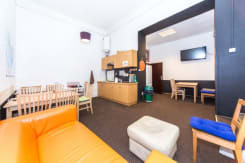 There are loads of interesting places to be found around the area. 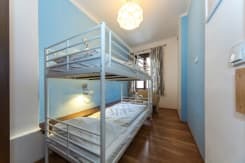 This large apartment (70m) has two rooms, sleeps eight-to-16 people and has a balcony right on Wenceslas Square its a great view! 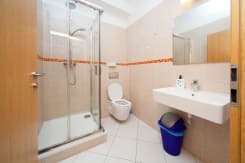 There is a bathroom with shower, WC, fully equipped kitchen, cable TV, a PC with free internet, and the opportunity to use a common room where you can find another kitchen, cable TV, computers and lounge area. 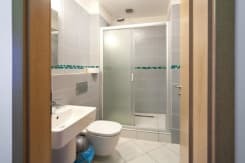 We offer free storage of your luggage after departure, free city maps, free clean and fresh bed linen, towels and pillows and free tea and coffee throughout the day. 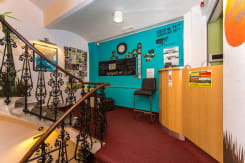 You can also use our iron, hair dryer, a printer, lockers and the valuables safe at our reception. We have local and international calls for good prices, too just ask! 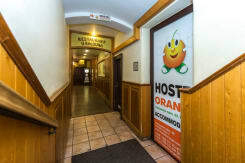 Our great location means were within walking distance to all points of interest, including the shopping area, the Comtessa shop, restaurants, clubs and bars (including Duplex, Celnice, Double Trouble, Chapeau Rouge and Karlovy Lazne a five-story club). 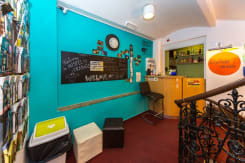 Payment is due upon arrival by credit card, debit card or cash; we accept payment in EUR, GBP and USD as well as CZK. 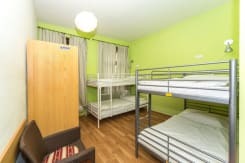 City Tax (15 CZK per person per day) is not included in the given rate. Please note that the front desk is open 24 hours. Late cancelling of the reservation (less than 48 hours to your arrival date) will result in a charge for the first night to your credit card. You have to take a bus 119, which goes straight to Nádraží Veleslavín metro station, (line green), afterward just take a metro towards Depo Hostivar to the station Mustek. 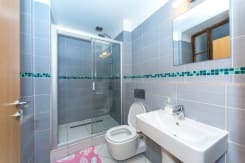 After leaving the metro, you'll be on Wenceslas square (Vaclavske namesti). 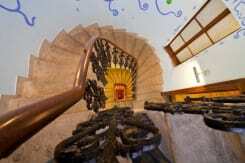 Then just find Vaclavkse namesti 20 (30 meters from Mustek station). The whole trip will take approximately 30-35 minutes. 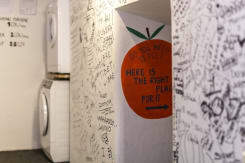 You can walk from the main train station - it will take 10-12 minutes to find us. When leaving the station, in front of you you'll find Opletalova street. Then just to to the left following this street in five minutes you will be on Wenceslas square (Vaclavske namesti). Afterwards you just have to find Vaclavske namesti 20. You will have to take a metro (Florenc station - Red Line) to the main train station (the main train station is right after Florenc towards Haje) and then just follow the previous directions OR you may go to Muzeum station (two stops from Florenc towards Haje). It's enough to buy a ticket for 24 CZK to get there. 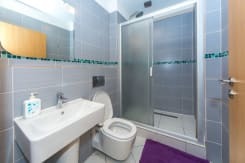 After leaving the metro at Muzeum, you'll be right on a Wenceslas square (Vaclavske namesti); then just go down the square looking for a Vaclavske namesti 20. The whole trip will take approximately 10-15 minutes. 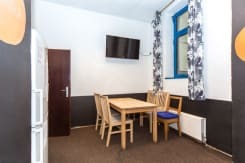 Located near Old Town Square, Jewish quarter, Charles Bridge, National theatre, Mucha museum, Museum of Communism, Shopping, Shopping centre Palladium, Boat rental, Lavka Disco, Disco Karlovy Lazne, Dancing house, jazz clubs, nights clubs, cool cave bars, and much more.